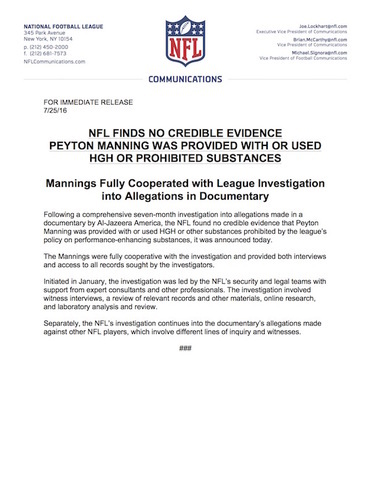 NEW YORK (AP) — The NFL says it found no credible evidence that Peyton Manning was provided with HGH or other prohibited substances as alleged in a documentary by Al-Jazeera America last fall. The league said the quarterback and his wife fully cooperated in the seven-month investigation, providing interviews and access to all records sought by investigators. Manning vehemently denied the allegations when they were made late in the season. Manning retired from the NFL a month after Denver's 24-10 win over Carolina in Super Bowl 50. The NFL is continuing its investigation into allegations made against other NFL players in the documentary, which the league said involves "different lines of inquiry and witnesses."